ISRO's Polar Satellite Launch Vehicle, PSLV-C31, successfully launched the 1425 kg IRNSS-1E, the fifth satellite in the Indian Regional Navigation Satellite System (IRNSS) today morning (January 20, 2016) from Satish Dhawan Space Centre SHAR, Sriharikota. This is the thirty second consecutively successful mission of PSLV and the eleventh in its 'XL' configuration. IRNSS-1E is the fifth of the seven satellites constituting the space segment of the Indian Regional Navigation Satellite System. 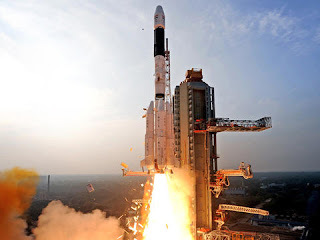 IRNSS-1A, 1B, 1C and ID, the first four satellites of the constellation, were successfully launched by PSLV on July 02, 2013, April 04, 2014, October 16, 2014 and March 28, 2015 respectively. All the four satellites are functioning satisfactorily from their designated orbital positions. IRNSS is an independent regional navigation satellite system designed to provide position information in the Indian region and 1500 km around the Indian mainland. IRNSS would provide two types of services, namely, Standard Positioning Services (SPS) - provided to all users - and Restricted Services (RS), provided to authorised users. A number of ground stations responsible for the generation and transmission of navigation parameters, satellite ranging and monitoring, etc., have been established in eighteen locations across the country. In the coming months, the remaining two satellites of this constellation, namely, IRNSS-1F and IG, are scheduled to be launched by PSLV, thereby completing the entire IRNSS constellation.